These printed cats were originally done for me by the yard by Jocelyn Benzaia, a friend and customer who sells her reproduction fabric designs on Spoonflower, but then I purchased the original uncut from her and then rebuilt the artwork for all subsequent prints. And since I like mine to look as old like the small collection I had but which has now disintegrated due to real age and exposure to light (I used to use them as photo props until they fell apart), I age all the cats and you would never know they weren't over 100 years old like the originals and stuff them with real wool. These will last for another hundred years as props in your doll setting or use the smaller sizes as an accessory to dolls large and small - even Hitty. NEW - This was originally a one-time sale item on the Garage Sale Page, but has proven to be very popular, so it will remain an item. 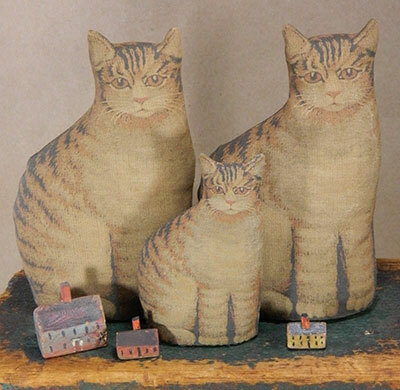 THE STORY: This is a long long story involving getting a new size of the much loved printed cats shown here. A good friend and customer, Jocelyn Benzaia, has been my supplier of the reproduction prints of the cats that I sell finished in a 3" size (shown center front) and the 5" size (shown in the back row). However, in trying to get to an even smaller size for Hitty (1-1/2" tall), I ended up acquiring through a simple mistake in ordering, scores of a 2-1/2" size, which I did not want. So, made up a simple kit to share in the bounty. The kit has one set of printed parts - front, back and bottom - plus instructions for how to make - you supply your own stuffing. Shown above are the 3" and 5" sizes. Above is the tiniest of all for Hitty at 1.5" tall. 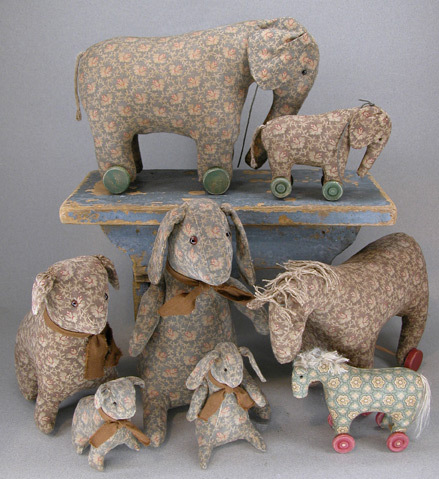 I have a small collection of antique primitive cloth animals, but because they are rare, I only have a few - two dogs, two cats, a lamb and one questionable species (dog or rabbit), but charming nonetheless and my favorite one. There is something so straight-to-the-heart about these sweet playthings, often sewn from old coating or other scraps and stuffed with rags. 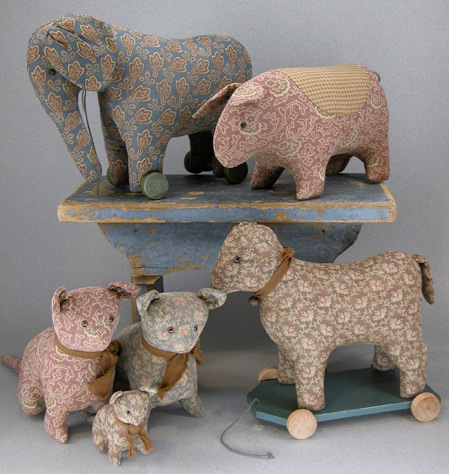 Like primitive dolls whose shapes are often pared down to the essentials (keeping in mind that most of these dear things were not made with patterns), it is this naive look that appeals. Most often one finds them in old dirty whites or browns as these coarser weaves were common, so most of mine will also be in these grungy tones. The patterns will inspire you to make them in many types of fabrics, one more endearing than the next. The animals are divided up into two patterns as well as kits for each one and completely finished. 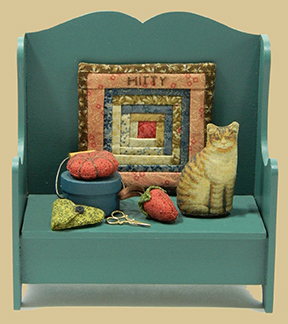 KITS - are discontinued in favor of the more popular patterns. Note: I still plan to do the official patterns for the smaller animals shown below in the color pictures. Glass eyes have wire loops to sew on. Use for my Primitive Animals. Now sold as a set. Boy has overalls and shirt; girl has pantaloons, dress and apron, plus two new variations I could not resist including for her clothes. Patterns and Instructions sold from old kits. Makes Two 2-1/2" tall felt rabbits in jacket and clogs and flowered apron. Together they share their felt basket of carrots and their tiny wooden wheelbarrow. These are actually the very same fabrics and colors used in the original kit from 1982. This kit is brought back with updated patterns and the original painted wooden wheelbarrow included (used to be a separate kit). Limited quantities.